So what’s the big deal with a start page? 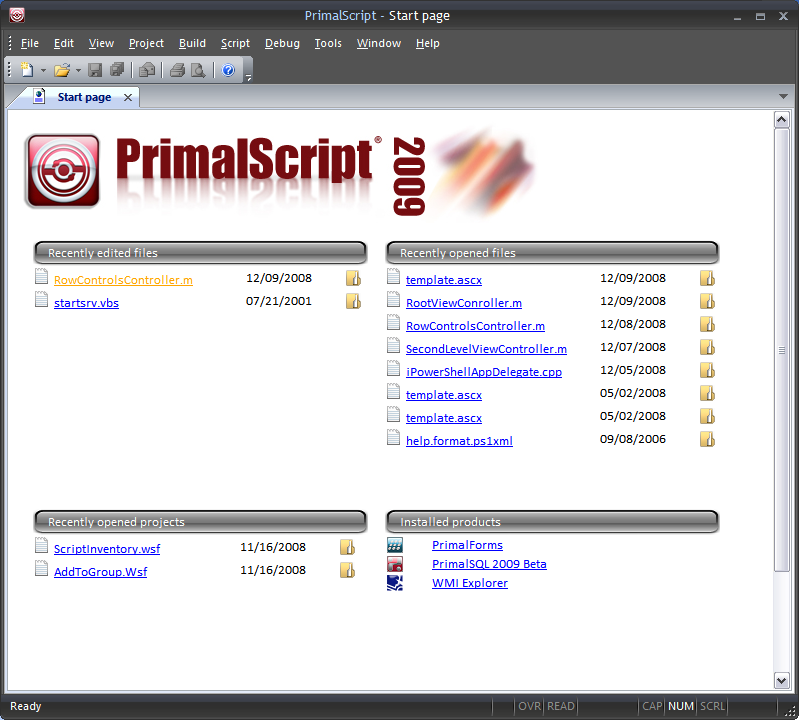 Well, for PrimalScript 2009, we have redesigned our start page to be more helpful and useful. The new start page is divided into 4 sections: Recently Edited Files, Recently Opened Files, Recently Opened Projects and Installed Products. Let’s take a closer look at these sections. The Recently Edited Files section displays a dynamic list of files that you have recently changed. 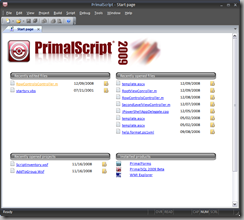 Each time you restart PrimalScript 2009, this list will be updated. 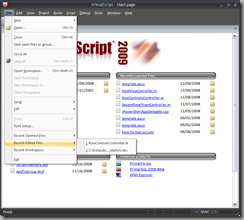 For all the sections, the list items are links to the files and you can just click on the link to reopen the file in PrimalScript. The Folder icon at the far right is used to open the folder in Explorer which contains the file. The Recently Opened Files section shows a list of files that you have opened but not changed. This separation from the more common MRU listing style of showing ALL opened files together with edited files helps to declutter your workflow. Now you can open any files you want without having to worry about important (edited) files dropping off your MRU list. The Recently Opened Projects section does the same for your project files. The Installed Products section displays a list of all SAPIEN products that you have installed on this particular computer. Clicking on the link will launch that application. We have also made corresponding changes to the MRU lists under the File menu. 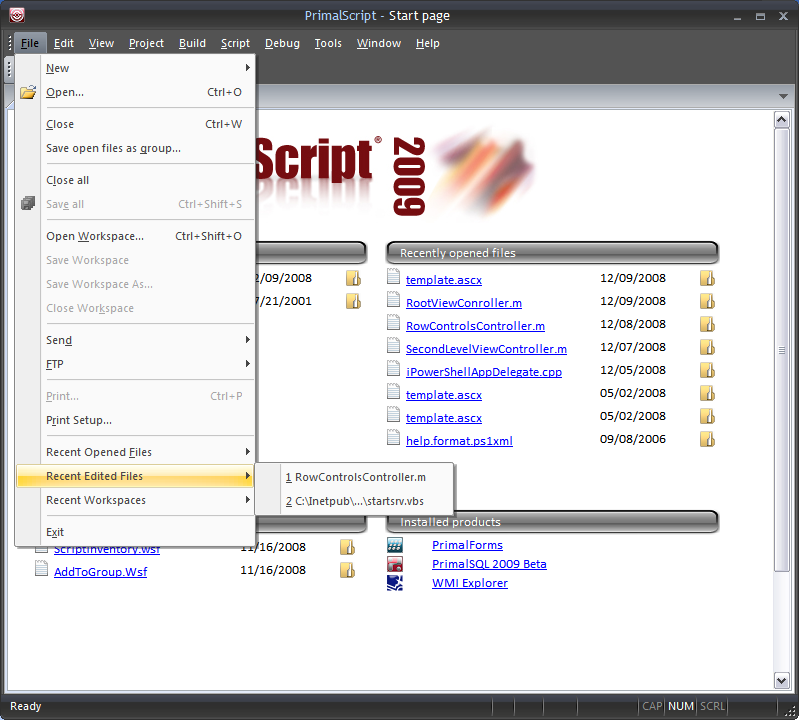 As you can see from the image above, the File menu now contains three separate MRU lists: Recent Opened Files, Recent Edited Files and Recent WorkSpaces that reflect three of the Start Page Groups.